On the outside, the 7200.9 drives look identical to the 7200.7 and 7200.8 series of desktop drives. On the inside, the 7200.8 line was the first to incorporate the highest density platters to date in their 400GB version drive at 133GB per platter. 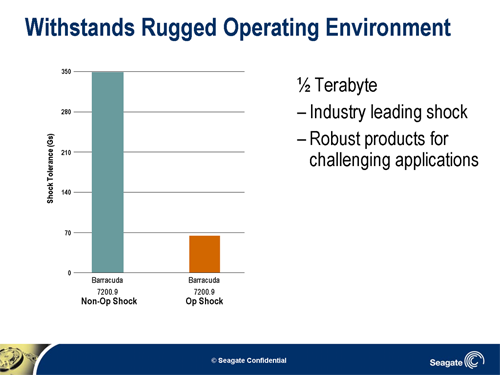 This puts Seagate ahead of Hitachi who released their 500GB DeskStar quite some time ago. The new 7200.9 line has incorporated a higher density 160GB platter into a few of its drives. 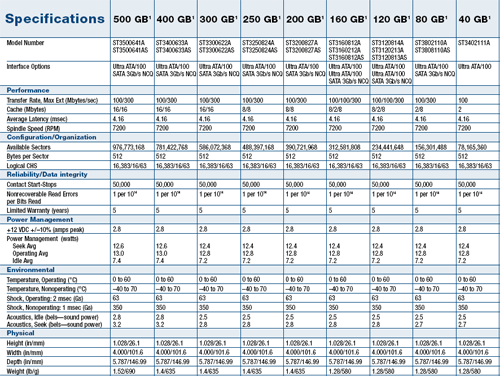 The following screenshot shows the manufacturer's specifications for each 7200.9 drive according to capacity size. A few months ago, we cleared up some confusion regarding the SATA naming conventions and what they mean. The confusion was with the SATA II name being used in unison with the 3.0Gb/sec transfer rate. SATA II was actually the name of the SATA standards organization, which decides the specifications for each SATA version. (They've since changed names to SATA-IO.) At the time, many thought that the 3.0GB/sec came standard in all drives labeled as SATA II. In fact, transfer rate along with other options such as hot plug, hot swap, and NCQ are options that drive manufacturers can implement in their products if they choose. You can even get most of the "SATA II" features in "SATA I" drives. The features listed above are only a start to what SATA should bring to the table. The SATA-IO group is continually working on updates to their specifications and we hope to see transfer rates and error checking features mutate into something extremely valuable to desktop and enterprise users alike. In 2004, 20% of hard disk drives shipped were SATA based - about 41 million, according to Seagate Market Research. It is estimated that this year, the percentage will increase to 80% of shipped drives being SATA based, 40% of which will be Seagate drives. Meanwhile, PATA is being phased out and nearly all production will cease by the end of 2006. 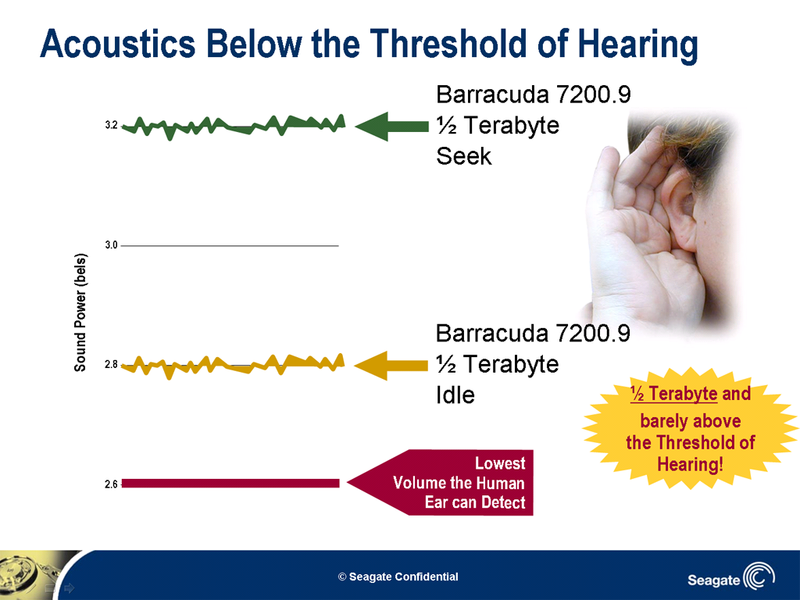 Seagate is also reporting a lower sound rating between 2.5-2.8 bels while the drives are idle, and about 2.8-3.2 bels while the drives are seeking for data. According to Seagate, the lowest amount of sound audible by human ears is about 2.6 bels, so the idle noise output is borderline inaudible to our ears. Combine this with the hum of case and heat sink fans, and the hard drive is basically silent. In the next few weeks we will be looking at the performance of the 500GB 16MB SATA model of the 7200.9. We'll put it through our usual synthetic, simulated, and real world tests, and we'll compare it not only to the 400GB 7200.8, but also to some older drives like the 120GB 7200.7 as well as Maxtor's and Hitachi's higher capacity drives.